Price Of New Kitchen Cupboard Doors and Worktops? Wanting a new kitchen but just don’t have the money? Did you know that you stand to save thousands of pounds by just giving your kitchen cupboards a facelift? Instead of funding an entirely new kitchen, why not spend a fraction of the cost and replace kitchen cupboard doors and worktops instead. The results can be astonishing and you will give your kitchen an entirely different look. For the majority of people, their kitchens have served them well for years and they now just need a different look. Over 70% of all kitchens replaced in the UK every year are still functional. Costs less compared to entire kitchen installation saving you money if you are on a budget. Causes less upheaval and work can be completed in lesser time so you can get to enjoy your new kitchen sooner. Good for the environment because by keeping your existing cupboards and worktops you prevent the waste from going to landfill. Easier than a full kitchen replacement and may be possible to do DIY, especially the cupboard doors. Quicker to install, new doors can be fitted in a matter of hours. Kitchen cabinets and storage units come in a variety of sizes as do kitchens. As a guide, you will find prices for replacing cupboard doors for small, medium and large kitchens. Also provided is an estimate of the time it will take to complete the job. We assume a small kitchen will measure 6 square metres and will have six double units installed. The job will involve removing the existing cupboard doors and then replacing with the new ones. The price for this type of work ranges between £100 and £300. The job takes on average under 8 hours. A medium size kitchen for this example is one which measures about nine cubic metres and is has 8 double units. The structure of the cupboards is assumed to be sound and requires no repairs. Costs a slightly more and start from £170. The top of the price range is £280 with the job expected to take up to 10 hours. When pricing a kitchen cupboard door replacement, it is important to ensure all quotes have the same specification. We assume a large kitchen to measure around 20 square metres in size with 12 double units. The job is to remove existing doors and replace with new. The cost for changing kitchen doors should be between £180 and £350 with the job expected to take a day or two. Instead of replacing your new kitchen you may opt for replacing cupboard doors and worktops only, retaining your existing storage. Replacing worktops is a cost effective way of giving your kitchen a new look while spending less money. Small kitchen under 15 square meters in size you can expect to pay between £200 and £300, with the job taking up to 8 hours to finish. Medium kitchen measuring roughly 3.5m x 3.0m the price for replacement is between £200 and £350 and should take about 10 hours to complete. For larger kitchens just under 20 square meters in size, removing old worktops and replacing with new can come around £450 with the work accomplished in a day or two. The prices used in this article are on the conservative side as other factors that a tradesman can determine when they come to quote will influence how much you pay in the end. For example, do any of the cupboards require any repairs? Also, all prices assume you will supply the worktops and so the prices include only fitting and the cost of materials. 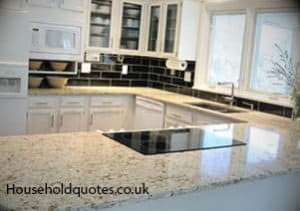 As you can see from the above kitchen cupboard and worktop replacement prices, you can get a brand new looking kitchen for a fraction of the cost of a new kitchen. Finding the right company to carry out your cupboard door fitting will contribute to the final result. Most companies are affiliated to trade bodies so that you know they care about what they do. You don’t have to make numerous calls to obtain quotations; you simply post your job and tradesmen will contact you. You will receive competitive pricing as tradesmen try to win your job; the final decision is up to you. To receive up to 3 competitive quotes for your kitchen cupboard doors and worktop replacement project, visit Quotatis today.